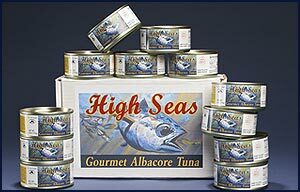 High Seas albacore is unique among canned tuna because it is produced by family owned vessels, we stand behind the quality of fish that goes into our cans. High Seas has 5 times the heart-health Omega 3 oil than other brands. Less than half the sodium of other brands. No additives are used, resulting in a difference you can taste! Many people who generally do not like fish still enjoy the mild taste of troll-caught albacore, since it doesnt taste fishy. Troll-caught albacore is very versatile in the kitchen and can be used in place of chicken. 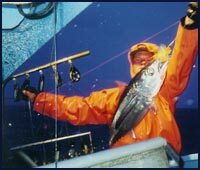 Troll-caught albacore tuna refers to 3-to-5 year old albacore harvested by trolling jigs behind a slow-moving boat. Commercial fishermen from North America have used this low-impact, environmentally responsible fishing technique to harvest albacore for nearly a century, while albacore fishing fleets from other countries tend to use other fishing methods. Major brand tuna is pre-baked in ovens, then the meat is removed and packed in the can. This causes the natural Omega-3 oils to be mostly removed and bleached away, hence the addition of vegetable oil or water is added before the canning process begins. For biological reasons, young troll-caught albacore have more beneficial Omega-3 fatty acids than older, larger albacore. Omega-3s are associated with reducing the risks or effects of heart diseases, strokes, high blood pressure, cancer, arthritis, lupus, and other diseases. Youll also find that because of their natural Omega-3 content, the rich, satisfying, yet mild meat from troll-caught albacore needs less mayonnaise or other unhealthy fats in your favorite recipes. Our quality loins are hand filleted and hand packed. The lid is then sealed, and the can is cooked only once. All the natural value of the fish is in the can. This is a natural solid pack, no water or oil is added just a pinch of salt. At the same time, processing techniques can be a significant factor in the canned albacore Omega-3s content. The vast majority of canned albacore sold by the big major brands comes from older, larger albacore that has been cooked twice. This makes it easier for assembly line workers to skin and de-bone large amounts of tuna, yet most Omega-3s are unfortunately lost in the process. Some fishermen are therefore offering their own custom-canned troll-caught albacore that is hand-packed and cooked only once in their natural juices to prevent the loss of Omega-3s and flavor. One should also realize that troll-caught albacore is not always easy to find or even identify. The vast majority of albacore available in the US today is the older, larger albacore harvested by foreign fishing fleets; consumers interested in trying troll-caught will need to specifically ask for it in most restaurants, supermarkets, and at seafood counters. That said, some retailers and restaurants in the Pacific Northwest offer troll-caught albacore. 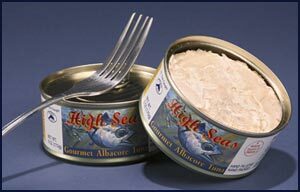 Custom-canned troll-caught albacore is also available by mail order and on the internet, and each year fishermen in different harbors sell part of their catch directly to the public.